Our latest comic has been a long time coming. Every week Frankie and I head over to our local International House of Pancakes and write Rule Zero. However, when we first started plotting out scripts for Rule Zero, we started off on Skype. It was during one of our first writing sessions when one of us blurted out the line “Yolo. My last name is Yolo.” We didn’t have any idea who would say it or why, but we cracked up. We quickly jotted that idea down in The Bank, where we keep everything we think of for the comic, and went along. When we finished up our first storyline, we went back and forth about whether we should do some one-shot comics or jump into another story. Yolo called to us, as YOLO tends to do in anyone’s life. We needed to have a reason for this strip to exist, and so the entire storyline of “Paradise Lost” came about as a result. It’s come together better than we thought it would, and the characters have surprised us a few times. In other news, it looks like Frankie and I’s time has wrapped up for now in WoW. He mentioned it in a previous post, but I’ve been playing on and off since the release of WoW. I used to play Final Fantasy XI, and was amazed at what I could do in a game like WoW. Jumping, for instance. The bar was set low in some areas, I admit. I had left WoW towards the end of the second expansion, Wrath of the Lich King. Some of my favorite times in WoW were connected to that expansion, but the inclusion of things like Looking For Dungeon, where you were grouped with random people from a variety of servers and teleported instantly to a random dungeon, eroded what I wanted out of the game. I’ve grown to accept LFD, and I actually grew to like it, but WoW is a game of give-and-take. For every advancement you see in the game, you lose a part of what made the game fun for a group of people. Social interaction was the reason I pitched in money for the game, and once that was gone I packed up my keyboard and mouse and left. I came back briefly for the next expansion but didn’t spend too much time in Azeroth, all things considered. Once they announced the Mists of Pandaria, I was excited all over again. The chance to play the Pandaren, my favorite race in Warcraft, was too good to pass. I jumped on the game early and eagerly awaited the inclusion of the best race ever. 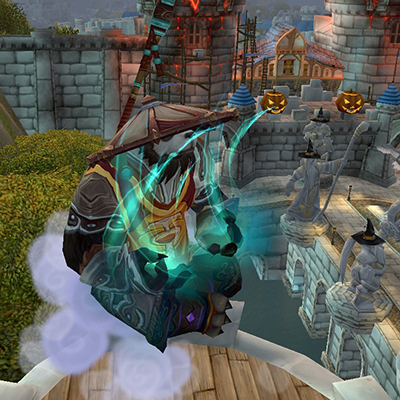 Mists came and I wasn’t disappointed; I finally had the class and race I wanted in my Panderan monk named Pazmo. Frankie and I quickly leveled (we hate the old content pretty universally, so Recruit-A-Friend was amazing). Things were going great until we finished up the first zone in Pandaria. Questing started to drag, the story started to become disjointed and formulaic again, and worst yet, the game’s story made it pretty clear that PvP was basically Azeroth’s version of entropy; it was going to destroy the world. The game makes a fantastic case for why both the Alliance and the Horde need to stop fighting, and did a great job of showcasing how destructive the war was. Frankie and I are a bit more role-player than maybe we should be; it was hard to play our characters as bloodthirsty heroes of the Alliance after what we saw. Besides that, we had a chance to play some of the new dungeons, and I don’t know other people hate substance, but the dungeons we played were beyond short. I’m talking like, three hallways, a few bosses, and the exit door. So, the game quickly lost it’s appeal again. We’ve picked up Guild Wars 2, which we’re both liking a lot. The lack of subscription means we don’t have to “dedicate” ourselves to the game. We can play if we feel like and not worry about getting our money’s worth. The combat seems more fun so far, and though I miss not having a healer, it’s been a fun game to pick at as we have time. We need to get back into some Left 4 Dead 2, and if there’s enough demand for it, next time we play maybe we’ll record it and you can see what it’s like to game with a partner who hates your back almost as much as he hates the conservation of ammo.